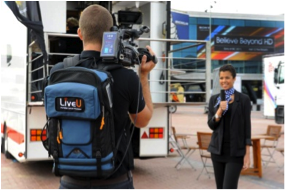 LiveU devices transmit resilient broadcast-quality live video from anywhere without the need for satellite or a wired connection, and substantially improve reliability compared to Wi-Fi or single air card transmission. LiveU bonds together multiple 3G and 4G connections across all major cellular carriers, as well as wifi and LAN where available. The devices can directly transmit live video to any UStream channel from anywhere, even on to move. The LiveU units receive a video input either directly from a camera or from a switching/recording device. 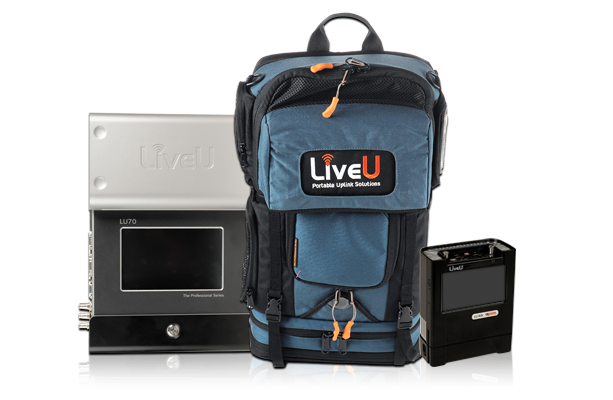 The units are battery or AC operated, and LiveU offers 24/7 phone and email customer support. Ustream customers can rent or lease LiveU units for any type of event or for ongoing usage. Thanks to its proprietary antenna, greater number of modems, and strong encoder, LU70 will have the most consistent and reliable results in certain challenging areas such as crowded venues, inside big structures, and farther away from cellular towers. LU40 is a lightweight, compact, and lower cost solution that is recommended for use in good 3G or 4G coverage areas. Obtaining the RTMP Address and Stream Name for your Ustream Channel. For information on how to get your RTMP URL and Stream Key, please see the following article here.